Pancreatic cancer is the third leading cause of cancer-related death in the Western world and is projected to soon become the second commonest cause of cancer mortality. During the past two decades, there have been important clinical developments in the fight against this aggressive disease. The aim of this review article is to summarize the evolution of the multidisciplinary oncological and surgical management of pancreatic cancer. 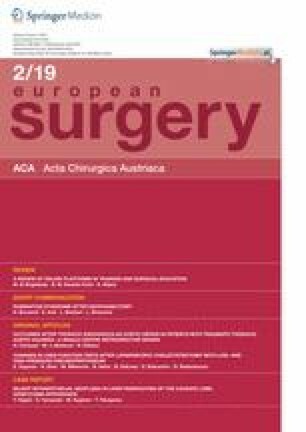 The centralization of pancreatic surgery into specialized institutions has led to improvements in surgical techniques, with reduced surgical mortality rates of <5%. With the development of more effective neoadjuvant treatment options, we can now achieve resections in a considerably greater number of patients with borderline resectable and locally advanced tumors, including some with oligometastatic disease. New surgical technologies such as laparoscopic and robotic surgery may offer the opportunity for reduced postoperative morbidity and increased quality of life. Adjuvant chemotherapy has become the gold standard after upfront resection in patients with resectable pancreatic cancer yielding survival times of 30–50% at 5 years. The ESPAC-1, -3, and -4 trials have defined the efficacy of monotherapy with 5‑fluorouracil/folinic acid and gemcitabine, and combination therapy with gemcitabine and capecitabine, respectively, whilst the PRODIGE 24/CCTG PA.6 trial showed that poly-agent FOLFIRINOX achieved a median survival of 54.4 months in selected patients. With the utilization of more effective neoadjuvant and adjuvant treatment regimens, improvements in surgical techniques, and the centralization of pancreatic surgery, the indications for pancreatic resection with improved survival have been greatly extended. U. Klaiber, S. Roth, T. Hackert, and J.P. Neoptolemos declare that they have no competing interests. Released on March 12. 2019. https://ir.celgene.com/press-releases/press-release-details/2019/Celgene-Provides-Update-on-ABRAXANE-Combination-Therapy-in-the-Treatment-of-Metastatic-Triple-Negative-Breast-Cancer-and-Pancreatic-Cancer/default.aspx. Accessed 21.2019.